This weeks book is one that I had not been familiar with until now. 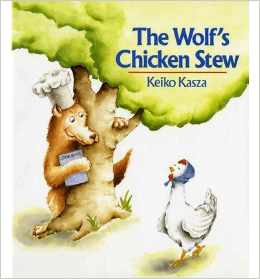 The book is The Wolf's Chicken Stew by Keiko Kasza. The great book companion to go with this book was created by Abby at Schoolhouse Talk. There are 31 question cards included in this packet. These questions all have picture prompts that are really great. There is also a page of 18 recall questions without picture prompts that you can use to check student comprehension. First, there is a Rebus Story that is a summary of The Wolf's Chicken Stew with pictures cues for joint story retell. This is really a really cute way to have students help retell the story. Next, there is a blank story map that you can use to help identify story elements and sequence events. Then, there are large story sequencing cards. I love these cards! Anytime I can have my students have visuals to help them retell a book is awesome! Abby also included a mini story retell book that students can put together and then take home to share with their parents. I learned to make books this way a while ago, and kind of forgot to use this way in a while. It was a nice reminder of a great way to create a mini book. Abby includes detailed directions on how to create this book. The next cute activity to target story retell is a story elements dice. You put together this dice and roll it to see which story element the students should identify. The next activity is comparing/contrasting. There are several different pages that use Venn diagrams to compare/contrast items and vocabulary from the story. There is also a blank sheet included to target your own words. There is also a vocabulary word web that you can use to help students gain a better understanding of vocabulary words from the story. The first game included is a barrier game. There is one background and lots of pictures from the story that students can use for different language and comprehension/following directions activities. Abby also included an open-ended game board that you can use with student as they practice their therapy targets. There are two sizes included. There is a writing prompt where students can write about their favorite foods and activities, and then color a picture to accompany their writing. There is also an /s/-blend activity that is super cute to target some articulation skills. Students put their s-blend "ingredients" into a silly stew. This packet is awesome! It was really great to use with my kindergarten students who are working on so many of these skills. You can get The Wolf's Chicken Stew Book Companion HERE. I LOVE, LOVE, LOVE all of Keiko Kasza's books! I read them to my class every year. 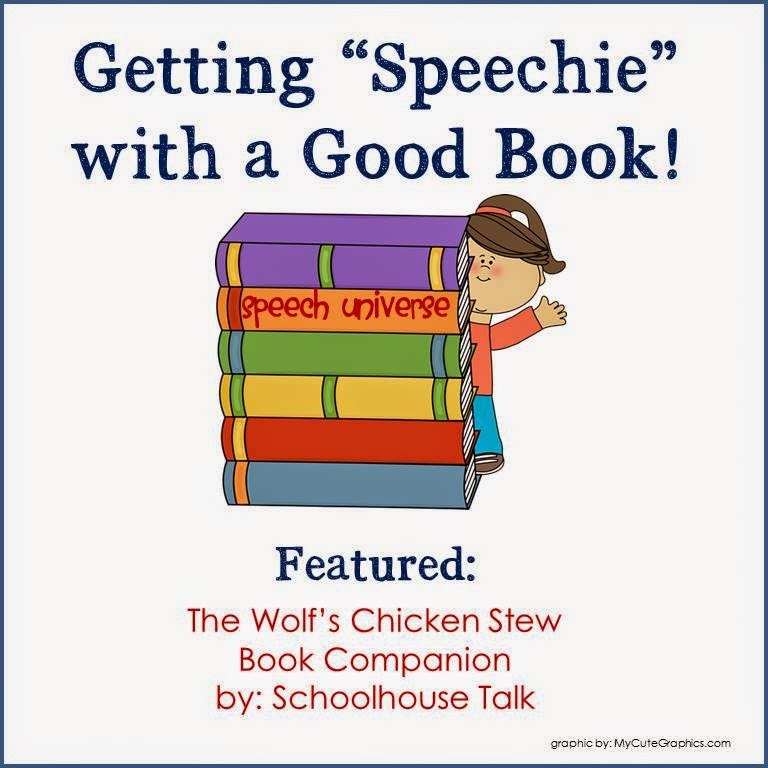 Thank you for posting the book companion to go along with The Wolf's Chicken Stew. I am currently a 2nd grade teacher and a former SLP. I may be going back to my first love-speech and I am always on the look out for children's literature activities.